Once every three years, at its national triennial convention, Sigma Delta Pi honors one of our most outstanding chapter advisers with a cash award and a beautiful plaque. Click here for a list of past recipients. The next José Martel Award will be presented in 2019 at Sigma Delta Pi’s Triennial Convention in San Diego, CA, in conjunction with the AATSP’s 101st annual conference at the Town and Country Hotel, July 8-11. A nominee for this award must have served at one college or university as a successful chapter adviser for five consecutive years with at least one initiation each year, be currently serving as chapter adviser, and be nominated by a chapter or by a member of the Executive Council. The nomination must document the accomplishments of the adviser in connection with the chapter, as well as the adviser’s other academic achievements. Supporting letters/e-mails from the nominee’s dean and another high college official must accompany the nomination. It is suggested that the activities of the chapter during the past five years (including the 2018-19 academic year) be enumerated and described, and that a résumé detailing the nominee’s professional activities be included. For the 2019 award, the complete nomination packet must be sent by May 1, 2019 via e-mail to the Executive Director at delmastromp@cofc.edu. Incomplete nominations will not be considered. Looking for a special holiday gift for a Sigma Delta Pi member? Kalamazoo Regalia (click here) for t-shirts, sweat shirts, ball cap, men’s silk tie, medallion pen, travel mug, license plate frame and membership certificate frames. Herff Jones (click here) for the Sigma Delta Pi pendant (choices of vermeil and sterling silver). Sigma Delta Pi’s National Office (click here) for the Sigma Delta Pi medallion. PLEASE DESTROY ANY/ALL SIGMA DELTA PI ORDER FORMS YOU HAVE ON HAND: BOTH ELECTRONIC AND PAPER VERSIONS. With this platform, Sigma Delta Pi “retired” its long-standing fax machine and NO LONGER has a working fax or fax number. Therefore please ensure that all future orders for pins and materials are always submitted using the aforementioned links. Using old MS Word order forms will only delay the processing of your future orders as e-mailed orders cannot be processed since summer 2017. And any attempts to submit orders via Sigma Delta Pi’s decommissioned fax number will be unsuccessful. Finally, please remember that only select Sigma Delta Pi merchandise is sold through the national office (e.g., medallions and the “repostero”). All other official and approved Sigma Delta Pi merchandise items are sold through our exclusive authorized retailer: Kalamazoo Regalia. 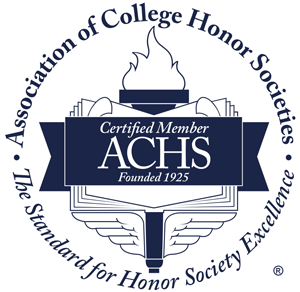 All purchases of honor cords, stoles, chapter starter kits, altar runners, certificate frames, registry, hat, silk tie, shirts and sweatshirts should be made directly at http://honorgrads.com/categories.php?category=Sigma-Delta-Pi. Thanks for your attention to these important details as we strive to avoid all delays with your ordering of Sigma Delta Pi membership materials and paraphernalia. If you have any related questions, please do not hesitate to e-mail us at delmastromp@cofc.edu or sdpnational@gmail.com. Student submissions for 6th Annual Sigma Delta Pi “Best Practices Session.” Click here for details. Chapter news and pictures for possible publication in spring 2018issue of Entre Nosotros. Click here for details. Orders for membership pins and certificates. Click here for order form. Sigma Delta Pi Chapters at Southern Utah University and Loyola University New Orleans were both awarded Chapter Project Grants for endeavors planned for fall 2016. Chapter Phi Iota at Southern Utah will undertake a Day of the Dead celebration on November 2, 2016, and Chapter Mu Kappa of Loyola U New Orleans will execute a Hispanic Cultural Celebration and related fund raiser on October 14, 2016. Each spring the 610+ chapters of Sigma Delta Pi are invited to submit applications for funding to support special chapter projects that reflect the mission of the National Collegiate Hispanic Honor Society. Proposals are evaluated over the summer, and applicants are notified prior to the start of the fall term. Click here for more information on the Chapter Project Grant program.